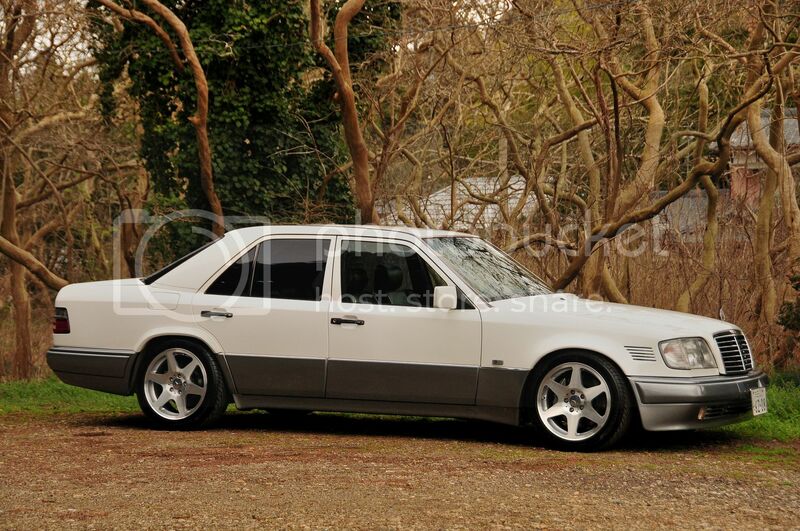 My W124 3 litre Turbo Diesel - Modernised. 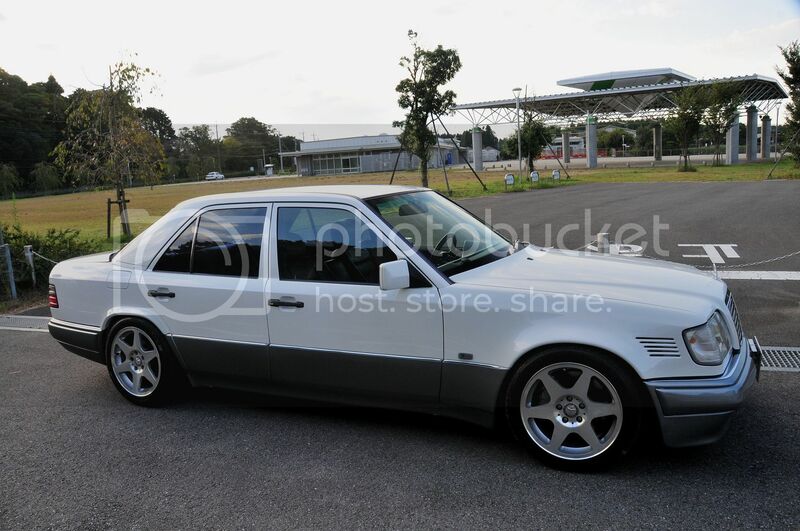 Thought I might kick off my membership here with an introduction with my '91 W124 3 litre Turbo Diesel. I still haven't done any tuning to the engine at all, after all - my wifr drives the kids to school & goes shopping in it, so this car needs to remain relatively sane, but I do like torque & power. Who doesn't! 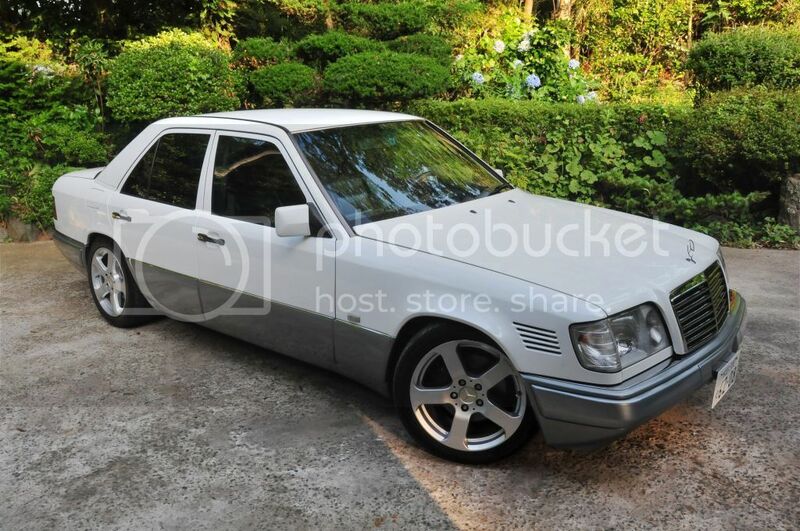 About 2 years ago, I decided it would be wise to stop changing cars every few years and just modernise an older, but good quality Benz Turbo Diesel capable of doing very high mileage & offer reasonable economy. Still, it's completely rust free & was cheap enough to buy, although I've spent a fair chunk on all the bits to improve it since & repair everything that was faulty. I've been steadily adding to a list & ticking things off as I complete them. It had taken 1 year to find this base car and after almost another year of ownership it's nearly completed, largely thanks to a friend in Germany who has sent many of the parts down to the smallest detail to help perfect it, whilst larger parts have been sourced used in Japan where possible (Dealer prices here are verging on stupidity!). All the exterior plastics were replaced with mint condition newer model's, of a darker and better looking silver colour - of original paint. 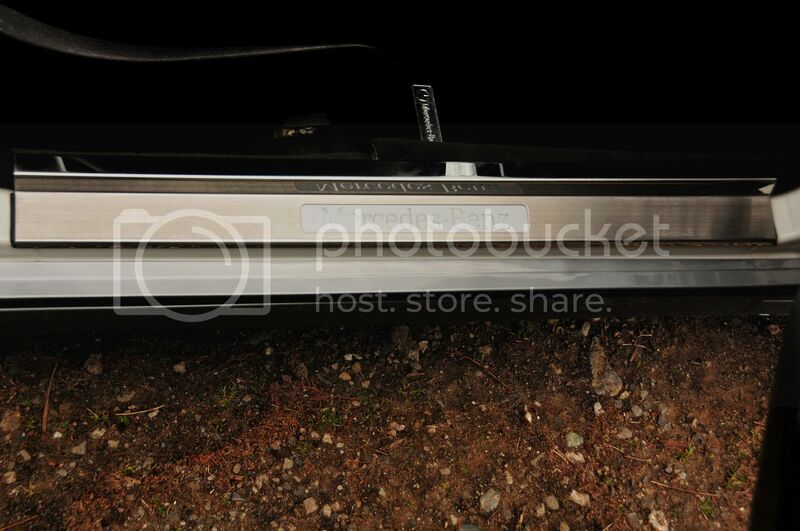 For licence health (from speed cameras), I fitted a rectractable front number plate mount. At around 100 km/h the plate folds flat. When I'm driving in town it goes back to horizontal & there's a lock to hold it in vertical position (for inspections). It has proper (500E) front & rear brakes & handling courtesy of new lower (500E) arms, Bilstein shocks, H&R springs and 500E / 320 Convertible ARB's. A new high quality sound system (Jelhert conversion at the front) & 200W speakers at the rear with top quality sound insulation. For aesthetics I fitted chrome door pins. I've avoided any temptation to add more chrome now - the flavour is to make the car more modern through improvement, not garish! I placed the amp in the trunk with all wiring properly routed and cable tied, with every terminal to crossovers properly crimped and shrink wrapped. The Parrot Asteroid head unit offers all the modern features such as Bluetooth / hands-free phone & voice control. All of the wood trim was replaced with dark 500E LTD original trim + 500E LTD Shift knob and I covered the original centre console wood panels in a Di-Noc dark colour brushed aluminium film. There's also navigation and self-dimming rear view mirror with compass. 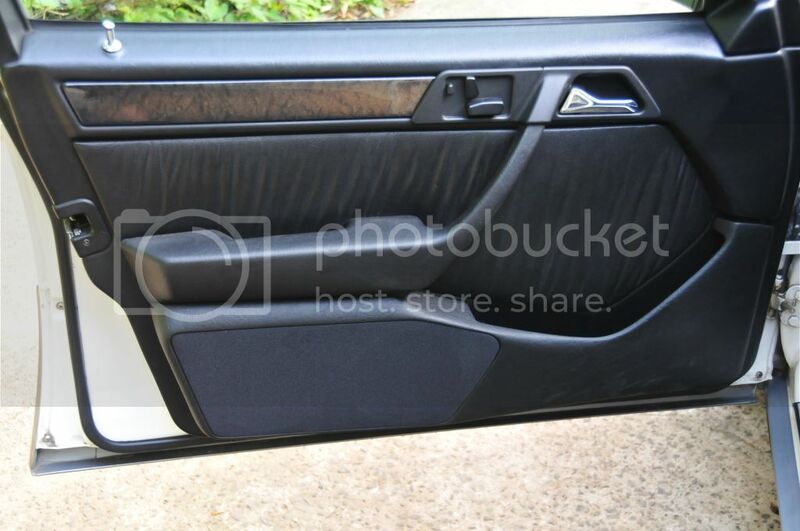 To make the interior family / kid proof, I sourced taxi floor trays which are easy to remove & shake dust, sand, etc. off. There's remote central locking too and the aircon is working super cold. 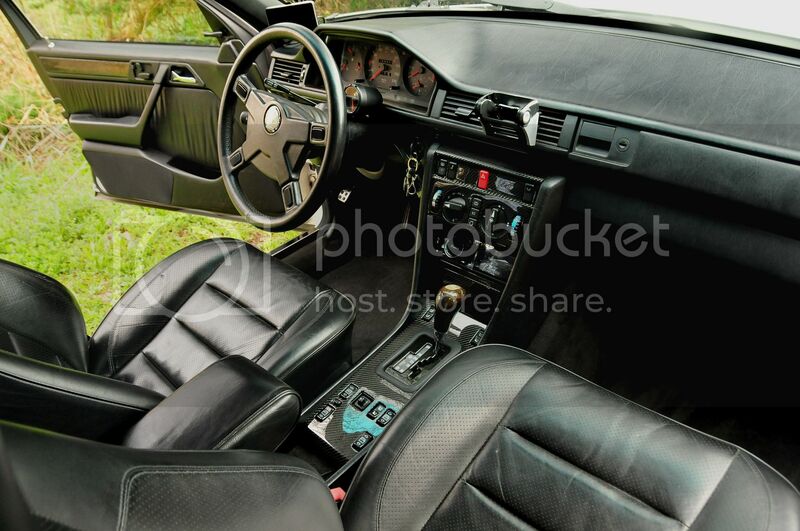 I also have a pair of 500E heated front seats with memory function - which will be fitted once I've restored the leather on them to perfection. I had thought of also fitting the 500E rear seats, but it's more useful to have a 5 seater than a useless box in the middle, I think (I had toyed with fitting a subwoofer in a custom enclosure, but kids don't need their ears blown out!). I changed several seals & gaskets all the way from the fuel tank to the fuel pump itself and finally it's become a completely oil-leak free engine. It runs perfectly & regularly delivers 600 - 700km per tankful of Diesel. Ride is smooth, rattle & nonsense free. Just a few more little details to iron out and it should easily last another 10-20 years by which time it'll be a daily driven classic car. I'm finally running out of things to do to it but have enjoyed noticing the thought & attention that went into the design of this car. It's proving to have been the perfect choice as a family runabout capable of cruising 1000km in a weekend in comfort when needed. It's got almost 200,000km now, but I don't mind how much mileage we put on. Feels great to have bank vault like build quality & classic German engineering integrity to take care of the family. 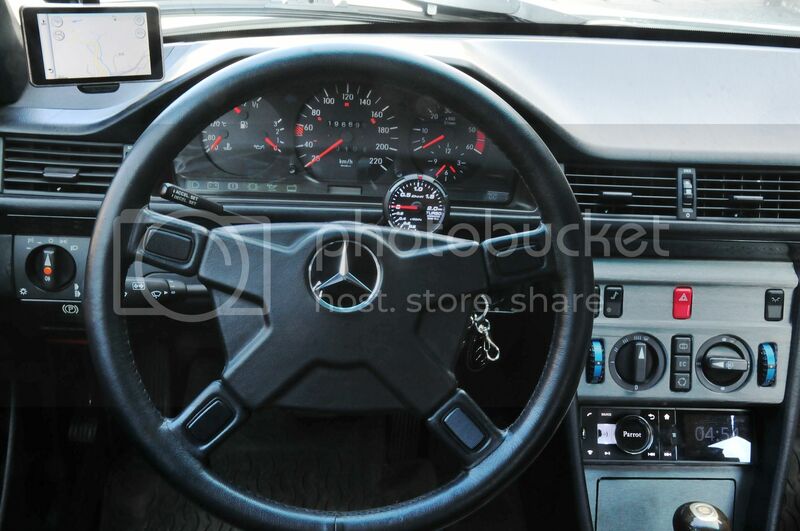 I wonder if in 20 years - today's Mercedes will still work as well as their older designs? With so many electronics & poor build quality, I think not.... but time will tell I guess. 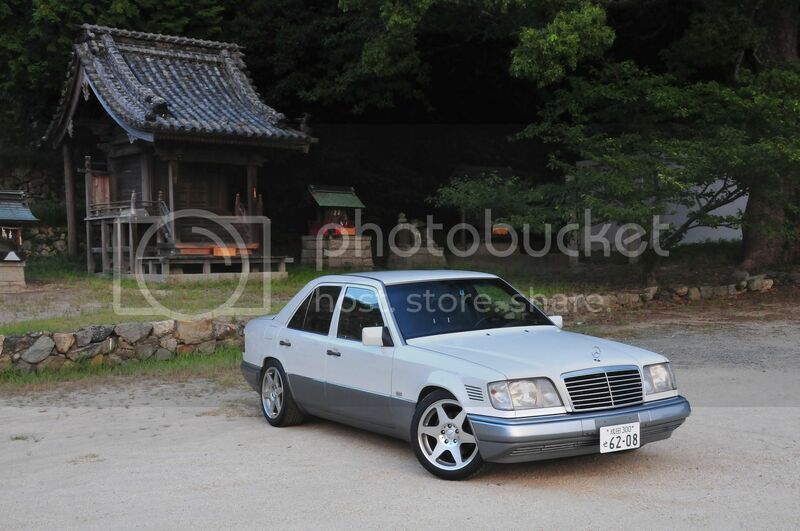 Recently I bought a set of nearly mint original 500E 17" rims. 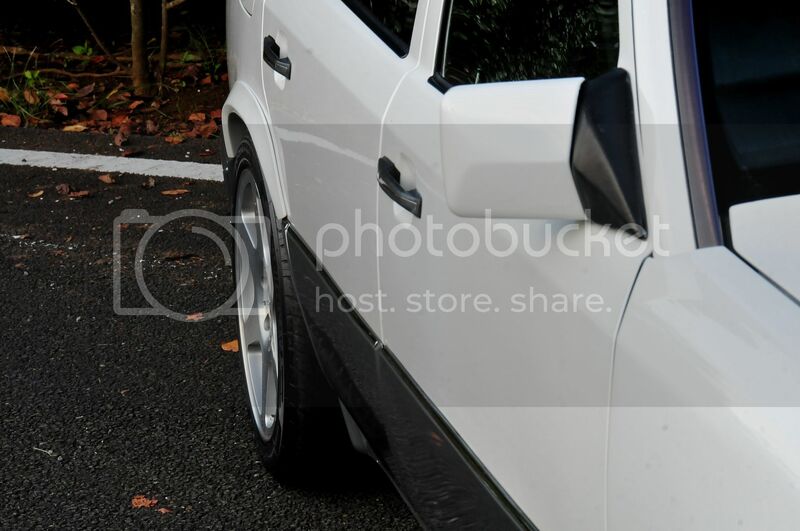 Nothing wrong with the rims that were on the car, but these are three quarters of an inch wider and should improve the stance just a little. I seem to have developed a fetish for 500E bits? The 300D Turbo's the keeper. We were on a national 1 week holiday in Japan, so whilst at my inlaw's place with my family, today I took the opportunity to fit some electro-luminescent gauges, which will also better match the Defi boost gauge I installed recently. From http://www.moman.eu I got Design 2,\ which closest matches the original design, incl. same rev counter & speedometer ranges as the 300DT. The description above's OK, but could use some improvement, but as I'm not a member there I can't add to the comments (If anybody else is, feel free to cut & paste the comments below so that someone else can use them in future if referring to that thread). (1). 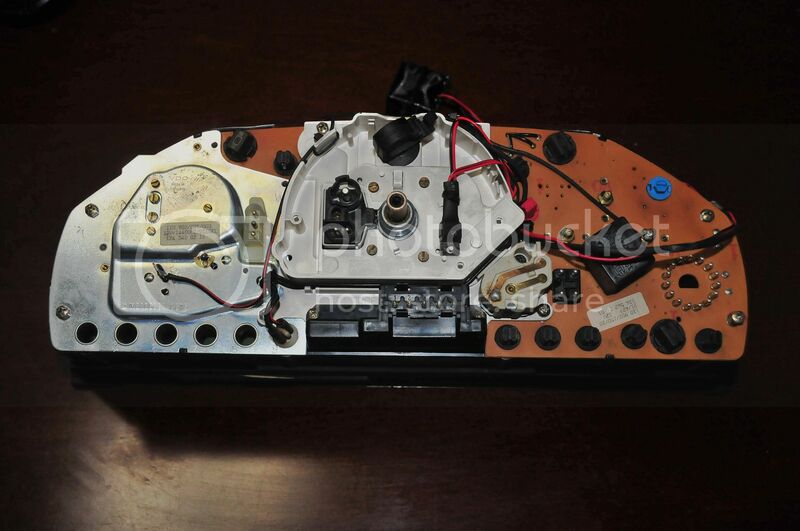 It's best to fill the tank to the brim before beginning, as the best way to refit the fuel pointer accurately is to power it up - by refitting the large round connector. At the same time you can also refit the oil pressure gauge's pointer - at 3 (I'll go there if only the round connector is fitted). (2). Only the following pointer needles need removing to fit (Use two small spoons to gently prize them off - it's pretty easy): Fuel Level, Water Temp, Oil Pressure, Clock. I masked the black centres off with selo-tape (It's all they had here and I forgot to bring masking tape with my selected tools for this job). (3). If you try to clean the inside of the perspex glass, don't use cotton buds - as little pieces of cotton woll can get caught in places & is a pain to remove afterwards! (4). The Moman kit is supposed to come with a "multiplier" for connectors. I couldn't find mine - but anyways a neater solution is to spice the wires together with solder and shrink wrap and have only one connector going to the inverter. (5). For the UV lights (To make the needles glow red at night) at the top of the cluster - I obtained power by soldering to one of the brass (earth_ connectors at the back of the temp gauge and obtained 12V from the connector for the clock (Ah bugger!!.... Only just realised this'll make the UV LEDS always stay on... 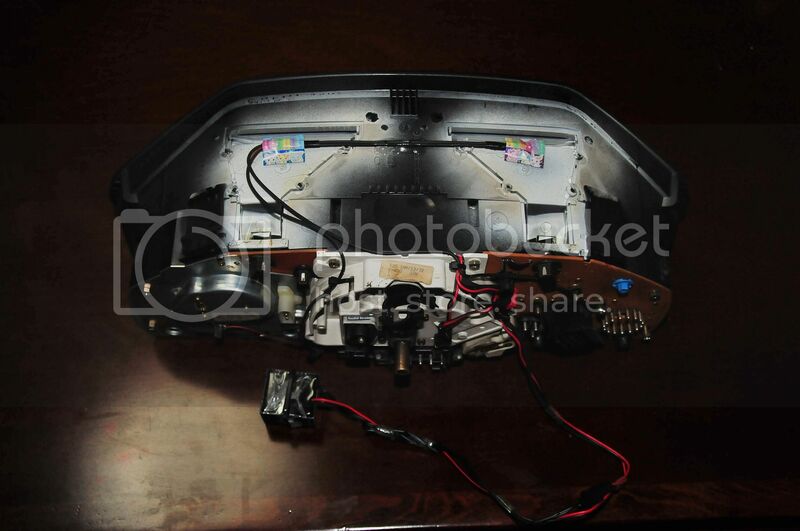 I'll have to get another 12V aux feed...A job to do tommorow... :o). Careful when drilling holes with this - as it's easy to go through the plastic then have the drill bit hit the clear plastic facia. Having a short drill bit helps. I took a couple of my daughter's sticky foil stickers and put them on the top of the UV LED's to help reflect their light back at the needles. Used plastic glue (Dries in about an hour) to hold these LED's in place and also to attach wires to the top of the cluster. (6). I obtained power for the inverter directly from the circuit board inside the cluster which gives varying voltage to the inverter (Confirm with a multimeter to know which terminal to solder to. It's easy to blow the inverter if the polarities are wrong!). (7). I only cut away one area to feed wires through, as shown in picture below, then used small cable ties to secure the cables both inside the cluster and outside. (8). Don't forget to remove the original illumination light bulbs from the cluster. You won't need those now the faces are lit with electro-luminescence. Anyways, it's all working OK now. I'll just need to re-do the power to the UV LED's tommorow. Below are some pics to show what it it looks like now. Will be interesting to see the difference later tonight. More pictures later....incl. 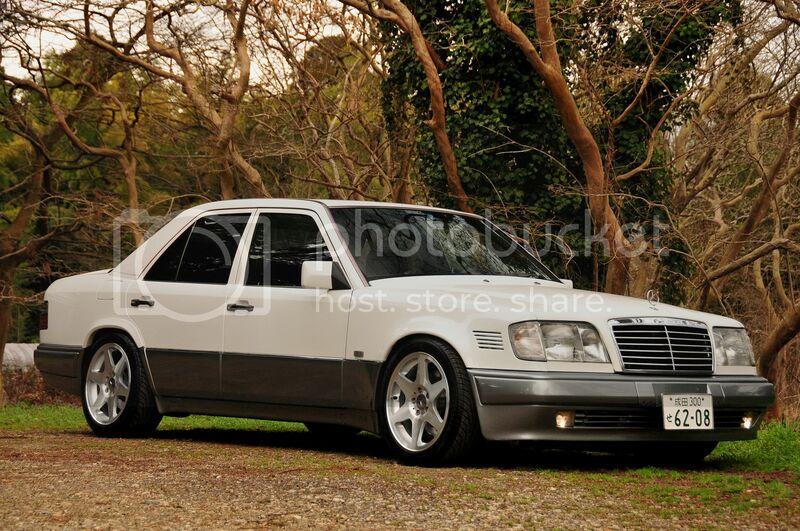 some of the car with the E500 wheels now fitted. Here's a pic of the EL cluster. I took the pic last night but exposure was so long, it came out a bit blurred. As you can see the needles are well lit by the hidden UV LED's too. Quite pleased with the result. Today I re-fitted the illumination LED's in the original position, so that hopefully the odometer will be lit as before. I also re-wired the power for the UV LED's. Turns out that pin 13 on the large circular connector is the one to use. A little tricky to get at with a soldering iron, but I got there by bending the legs of a diode away a little. Careful not to burn the edge of the temperature gauge's face - as I did slightly! 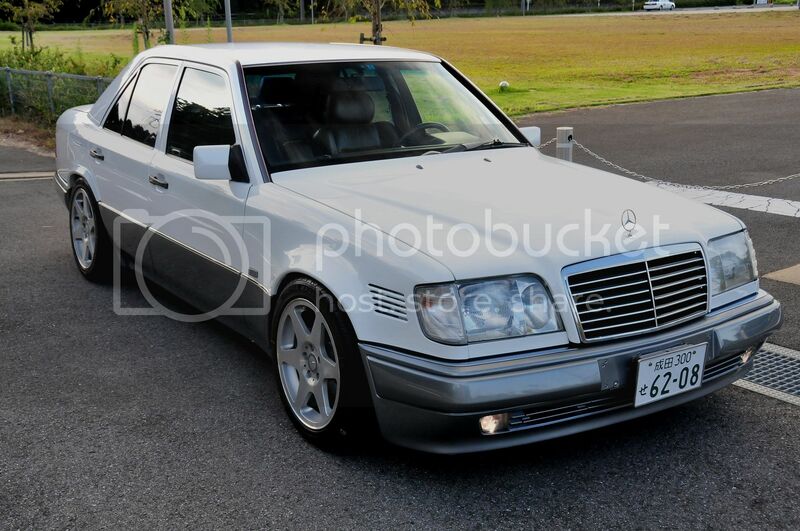 RE: My W124 3 litre Turbo Diesel - Modernised. 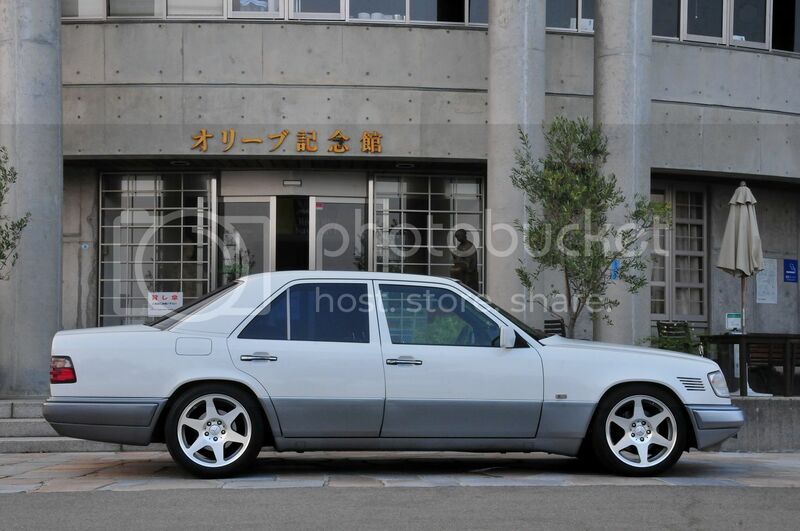 Have to say you have a clean W124... I saw your write up awhile ago about modernizing the car and I think you did a great job with the car. 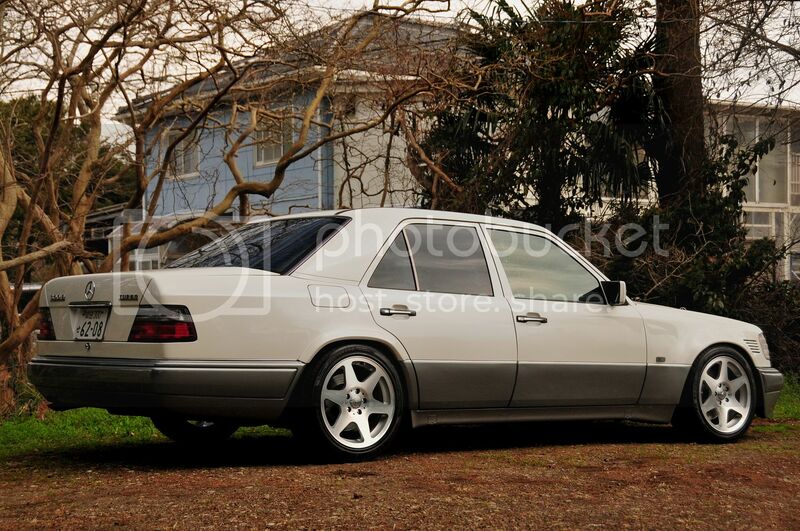 1983 300D Silver Exterior/Black inside - Sold and will be missed, may we never meet in a PnP. Six in a row make her go! Did you just finance that from the dealership cause that thin is fuggin clean man. Like seriously! How does that even happen???? Here i am driving around with a different coloured fender! Very nice car. You have put a lot of work into it for sure! Your attention to detail is immaculate. Thanks for the compliments guys. I was lucky to find a good example - it even came with the updated headlights, bonnet & trunk from the post-facelift models when I bought it. Here in Japan the roads are well maintained and well drained - and winters are mild, so cars tend to last very well compared to other countries. Also want to have the console panels in the centre laminated in twill weave carbon fiber and the roof re-trimmed in Alcantara for which I already have a great contact for. What I'm interested in doing now is getting a bit more power. Ideally without having to upgrade the turbo, but if I do - then I'd like to use the existing manifold & flange. Main priorities would be to keep it rock-solid reliable (Including the auto transmission) and reasonably economic. My wife is the main driver and she's not at all into going fast. So the car only gets some stick when I'm behind the wheel. I've tried searching but not yet found any threads with info on how to upgrade. Can anybody make any suggestions or point me in the right direction please? Any help much appreciated. A favor for a favor? (05-16-2014, 03:42 PM)Purplecomputer Wrote: Like seriously! How does that even happen???? Once you head down that road be aware that unscheduled downtimes may increase, both in frequency and duration. Might not be the ideal route if the car remains the "goto" family mover. Since you expressed the desire to keep your setup as stock as possible there's only so much you can do to the factory config that will produce any gains in power. It is possible, as some members here can attest, to coax another fifteen percent or so outta the motor in standard kit. Any significant gains in performance, when it comes to the oil burner, are realized ONLY after supplying more fuel per cycle. Period. You can modify or upgrade every other component in the engine bay (or elsewhere,) but until you increase the amount of fuel you force into that powerplant, you get zero ROI from any of it. Link above is a decent primer on the diesel injection pump and what can be done to the pump that comes standard on your motor. An excellent resource for those looking to add some extra punch while changing or modding as little as necessary. 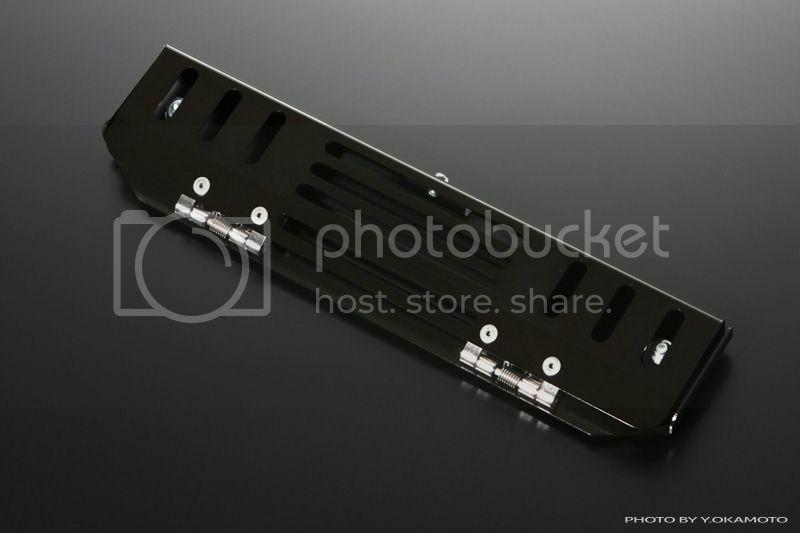 Would you mind slapping together a little howto on your front plate setup? That, sir, is way too MF koo! Was that an original idea or? So weird, I suddenly have the urge for a mahtini, shaken... not stirred. ETA: Bravisimo on the wheel selection. Those EVO's are CHOICE. They fit the 124 beautifully. Thanks mbz123. I'll digest that first thread. I'm not unfamiliar with modifying stuff - having built several (petrol powered) sports cars, etc. but the problem usually is I get too carried away and then the cars become so tuned they are no longer usable daily. 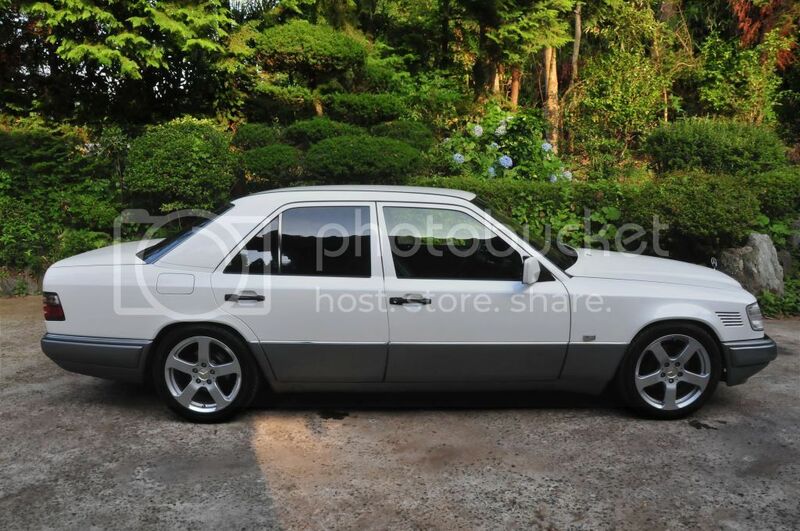 This Benz is intended to be a car we use for a very long time, so I might just opt to do nothing to the engine, except perhaps sort out the crank case breather into a better solution so gases & carbon don't condense in the intake. The number plate is a mechanism that is available for Skyline GT-R's here in Japan, but as it's not strictly legal is hard to get. I know the people well, who manufacture it though. The number plate needs to be mounted a little lower than standard to allow space for it to become horizontal when moving faster. I think it goes flat at around 60km/h, then returns to vertical position at slower speeds. If you'd like one, the price is $135 incl. postage from Japan to the US. PM me your e-mail address and I can send you a Paypal request for payment. Will take about 2-3 weeks to arrive to your door. It looks like you've got the EGR hooked up. If so, that's what's responsible for the lion's share of carbon in your intake tract. Power-wise, a pump with 6mm elements would pep the car up without changing it's character. Very nice car, excellent wheels. I respect your desire to keep it near-stock. Often big changes involve a lot of sacrifices. Yep, the EGR is still hooked up.... that's something I need to find a better solution for, as it makes a helluva mess and is just for reducing emissions (I guess)! 6mm elements - sounds interesting, I see them discussed in the 1st link mbz123 posted above, but as I've only ever tuned petrol engines I've no idea what they are and what they look like! Being a 3 litre Turbo right now it's not bad. Not super fast, but gets to about 200 km/h and isn't too slow in acceleration. The car runs at 0.9 bar of boost (12-13 psi) and I don't know how much more boost the turbo can give, but a 20 bhp increase in power would be welcome, I guess (I'm assuming the factory quoted figure of 150bhp is right & if so 170bhp would be nicer). Not sure I want to be fitting an exhaust temperature gauge. I guess I could, sounds necessary if I want to get a little more power - at least whilst I'm tuning it. But I don't want to lose driveability or smoothness of idle, nor reliability! 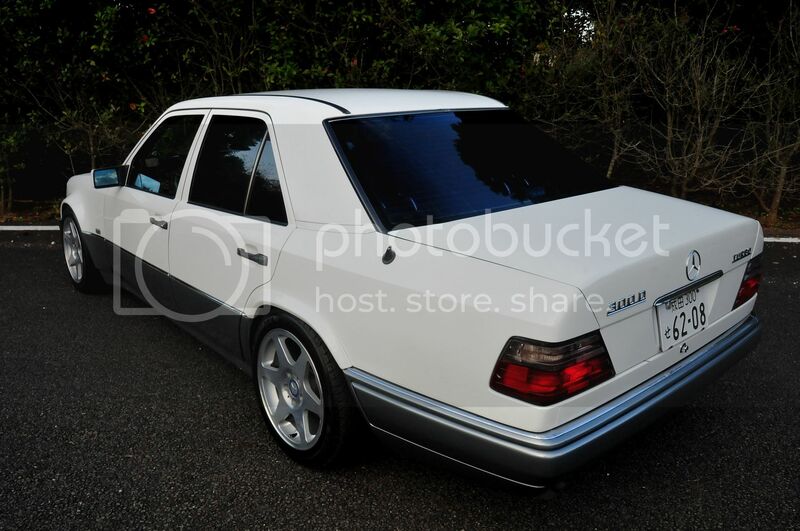 I have another Benz 300DT sitting under a cover, with the same (identical) engine as mine. I wonder if I should just whip the pump off and send it to someone like: https://www.facebook.com/dieselmeken - and have them re-work it for use in my car. Then when the re-worked pump comes back I just need to switch pumps between the two cars, re-set the throttle linkage and increase boost a little...? I presume that's all, I haven't done much research yet - but could this be a good way forward? I'd rather not be doing a lot of work, tweaking, etc. 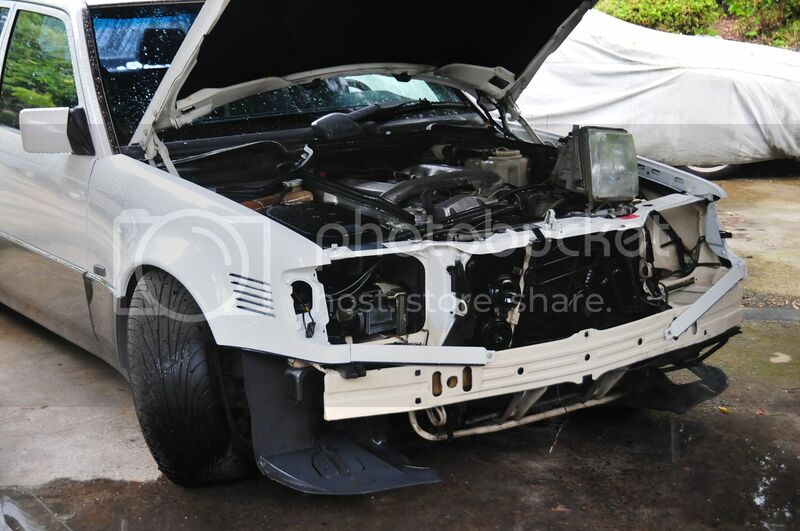 I don't mind spending a bit of money to get this work done, just want the best possible result straight off. 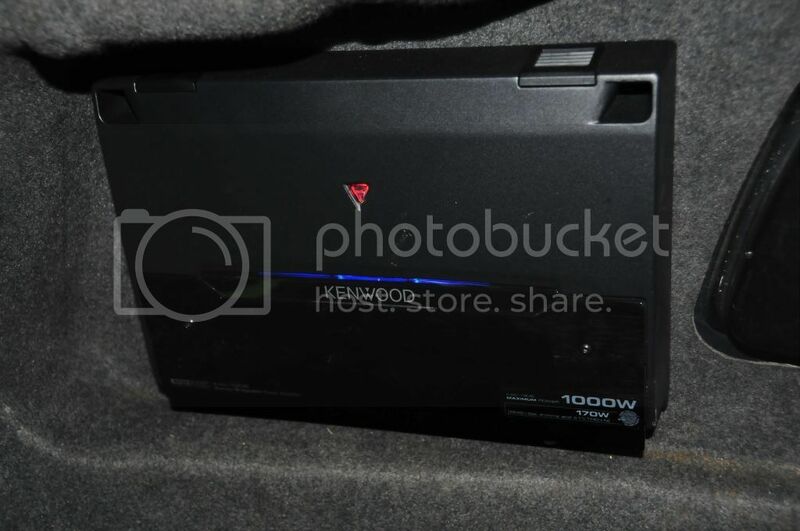 Not looking for huge power either - as I don't want to kill a perfectly good automatic box. My wife wouldn't drive a manual either. For 20hp, you probably won't even have to mess with boost. What reduces your power is the pump settings reducing fuel at higher rpms. You could probably squeeze another 20hp out of your stock 5.5mm elements by tweaking the pump. A pump adjustment would delay the end of injection to increase fuel quantity. This will result in higher egt's, partly because more power is being made, but also because delaying the end of injection can allow the combustion process to continue after the piston has moved too far down in the bore to efficiently make power. A bigger element can deliver more fuel in less duration, keeping EGT's cool. You can get 8mm elements adjusted for just a 20hp increase too, but the engine will be louder and driveability will suffer compared to the 6mm elements. You should contact dieselmeken. He'll tell you what pump mods you need to meet your goals and you should search some of the big element threads here to brush up on your diesel theory. EGR is supposed to reduce oxides of nitrogen by reducing combustion chamber temps with inert exhaust gasses. All modern diesel EGR systems have an EGR cooler now so the effectiveness of the uncooled EGR system on the 603 is dubious. Thanks Ray Sorenson. I've messaged dieselmeken and he suggested 7.5mm elements, but his response was short. Assuming these would work well with the standard turbo, I think I'll probably proceed, but I'll ask them about ideally sized elements for this application so I have a smooth running engine without temperment, that is reliable too. I think I prefer these easy solutions where I don't have to mess around too much. Will search big element threads indeed - so I can begin to understand what this is all about - but thanks for the explanations above, it all makes logical sense. I understand Goran has new 7.5mm elements and driveability may be as good as the 6mm elements. 6mm elements are MB parts from electronic inline pumps for the om606 and 605. They are very expensive unless you get a good deal on a used pump with these elements. I researched here, including dieselmeken's Youtube links for the differences from 5.5 to 6.0mm elements and it seems to me these would be ample for what I want to achieve. I don't want too powerful an engine that could result in a damaged transmission, etc. So I sent dieselmeken a PM earlier today asking the pros & cons of fitting 6mm elements to my pump. I'll await dieselmeken's response and go from there... Thanks again raysorensen for the initial advice - much appreciated. I was researching on here how to best deal with cleaning up the oil breather gases. Not wanting to drain onto the road, I figured this was an elegant solution. I might place a plastic catch can behind the bumper into which I can drain excess oil (& possibly condensed water) for the time being. Anyways, have ordered one of these in the two colour option. (05-19-2014, 05:33 PM)The Stig Wrote: Thanks mbz123. I'll digest that first thread. I'm not unfamiliar with modifying stuff - having built several (petrol powered) sports cars, etc. but the problem usually is I get too carried away and then the cars become so tuned they are no longer usable daily. 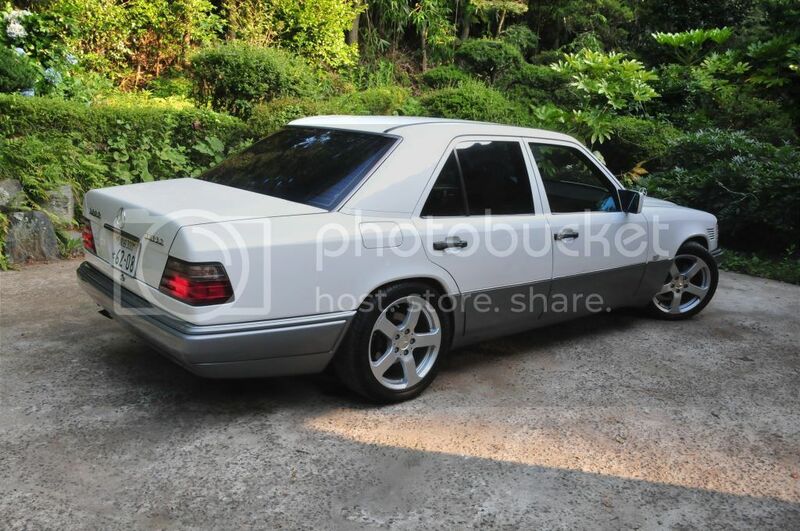 This Benz is intended to be a car we use for a very long time, so I might just opt to do nothing to the engine, except perhaps sort out the crank case breather into a better solution so gases & carbon don't condense in the intake. Ya, was obvious this ain't your first rodeo. Also, it was partly for the "carried away" phenomenon that I voiced the precaution. The performance gains you're seeking involve hardware/setup alterations that aren't conducive to your application. I'm not trying to imply simply bolting up a non-stock IP will net you an unstreetable racer, doomed to a life in the garage hoisted up on jackstands. However, your posts repeatedly mention "durability," "dependability," and most importantly "driveability" and all of these qualities are, to some extent, traded off in the pursuit of performance. If I were in your position, a serious look should be given to your other 124 sedan. On what little information is given, it appears that could be your perfect "test-bed" oppotunity. Use it as your franken-car and only transfer the mods over to the family truckster when you feel comfortable doing so. Takes nearly all the risk out of it. Revisit that thread I previously linked started by "gsxr" as it may be invaluable to your situation. It certainly is an invaluable resource on the whole and I would venture a guess the goals wrt the vehicle and even the daily situational/operational environments are highly similar for the two of you; albeit half a dozen years later for you. It really is a prudent and methodical approach with a $%#^ton of enlightenment along the way. WRT the crankcase breather setup. The arrangement on the 603a is a colossal improvement over previous versions. Furthermore, simply eliminating the egr (if regulations where you live allow this) will fix most of the issue. I suggest you focus attention here. After the egr delete you have several options for ccv. First, just leave it be, you'll see what remains isn't all that bad. Will it, over time, coat the intake path, sure. Nothing near the soot fouled nightmare that existed before, though. Next, you could route to the ground, or for das uber-grun types, into a catch can. Lastly, send the fumes to the down pipe by threading in an adapter. The only difference in your choice is the point of disposal: the air, the ground, the landfill. You wouldn't happen to be one of them clever blokes with their own WMO burner would you? ;-D After a few months with a catch can you might have a whole ounce of waste liquid to heat with! FWIW, I blocked off the egr and left the ccv stock. IMO, not worth the energy, you see what I did there? Anyways, I'll await dieselmeken's response and go from there... Thanks again. Although I have never tuned a Diesel, I can appreciate higher EGT's & turbo maxed out aren't going to do me any favours long term. And I really don't fancy a damaged transmission from excessive torque. Despite the evil side of me trying to convince the logical side it'll all work out alright - My intentions of having a trouble free family car that runs perfectly for a decade+ aren't likely to mix with excessive power. I was driving the Benz with the family inside when we went out for a meal last night and it came flooding back: This is such a nice car to drive as is. Maybe it's too much to risk in having the IP tuned. 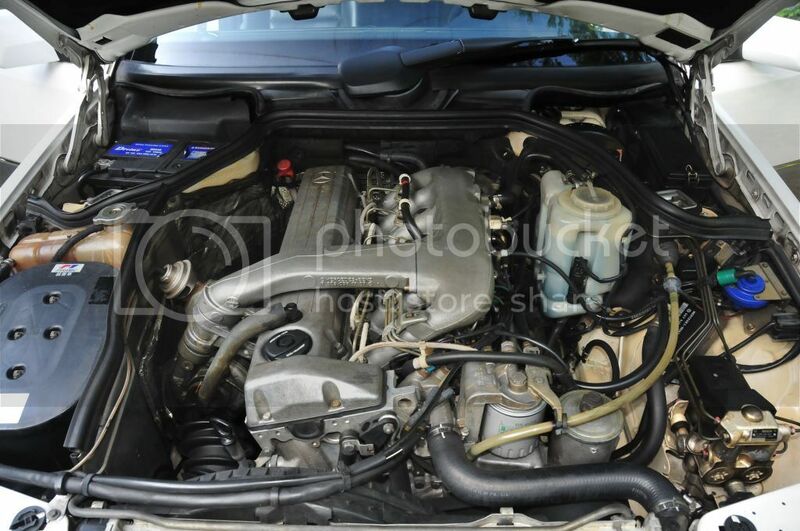 As for EGR, I just took a peek under the bonnet. There is none as far as I can tell. It's a European model with exhaust gas going directly into the downpipe. Without much thought - I was confusing what EGR means with blowby gases from the breather. Anyways, I ordered that fancy catch can yesterday, complete with a tap and hose for drainage. I'll probably just drain it into a small bottle from time to time, but at least it won't make such a mess in the intake any more. I guess what's important is I enjoy driving what I am sitting in and I really like the car as is already - would be a shame to spoil a good thing. Thanks again mbz123. You helped put some sense in my head. I'll continue to update this thread with new stuff I do to the car anyways and watch what the crazier members are doing with their's. BTW - the folding number plate mechanism is simple. It's made with sprung hinges. If you look at my picture above it's pretty easy to see how it works. 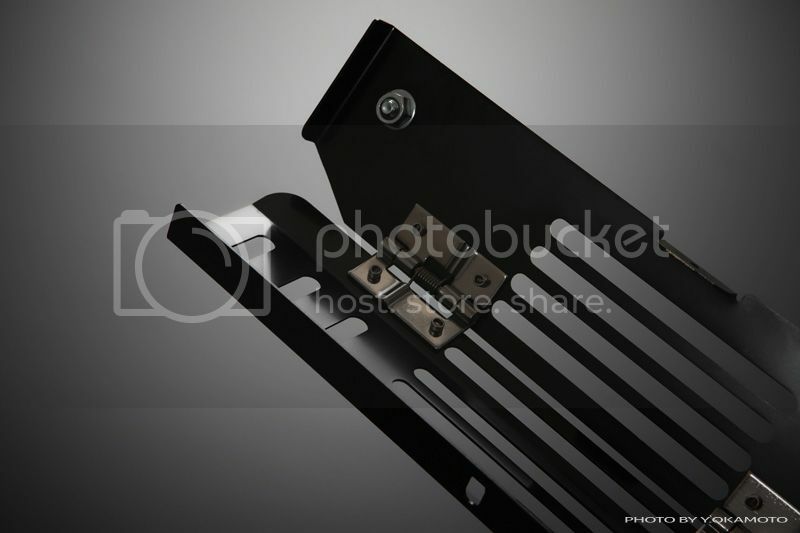 The trouble with DIY production is finding hinges with the right spring rates for allowing the plate to only fold at a preset speed and engineering it all, folding aluminium (Or steel & painting), making it all work smoothly, etc. Having seen a few different designs and used them over the years (We only have forward facing speed cameras in Japan - and these are licence savers) I wouldn't want to try making one. I'd rather work, earn money and pay someone else to go through the hours of messing around... but if you make one yourself, post pics & a writeup afterwards. I found it quite funny to watch the front number plate disappear in a rear view mirror when being followed by my wife. She doesn't even realize it does that! Recently I added a little chrome'd number plate surround too, to stop the plate getting bent if it gets caught by a hose, bumped by kids bicycles, etc. Very neat design. I think youre the first STD'er from Japan. So you got that going for you. 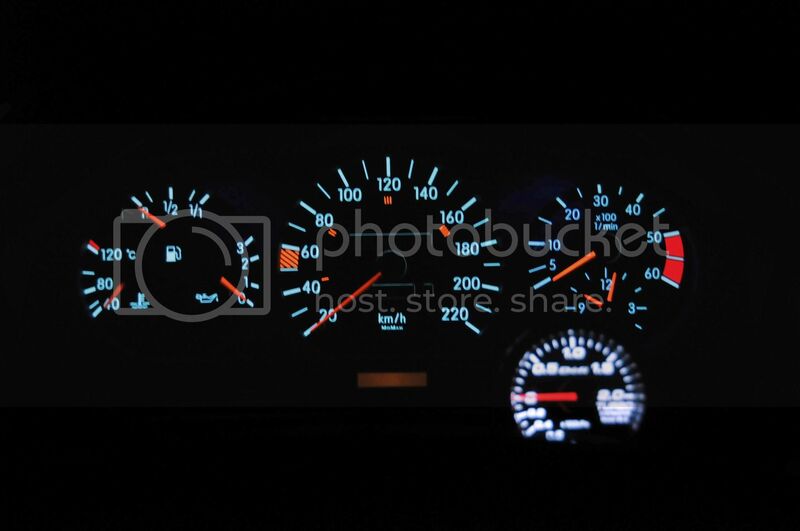 Im really impressed by your gauges. I was also impressed by the fact that you used UV light to light up the needles. Genius! Ill admit i didnt read all of it and I kept wondering for days how you managed to do that. Also I wanted to ask about your stereo. Would you recommend it? I really want a unit capable of Bluetooth streaming and this one seems to have more then what I would need, so i have to have it now! The Parrot - this particular head unit is very good. The original software is a bit troublesome and would sometimes crash, etc. It was quite annoying at first... but then there is a complete software update that's downloadable from Parrot's website and with it it works fine & fixes all the bugs it had when it came new. So all is forgiven. With a smartphone it will find the music you want by voice command, or call someone up on your phone's directory. It also does some clever things with internet access and you can get a huge range of online radio stations, etc. It's recently been discontinued, but you can still buy it - not too expensive either. 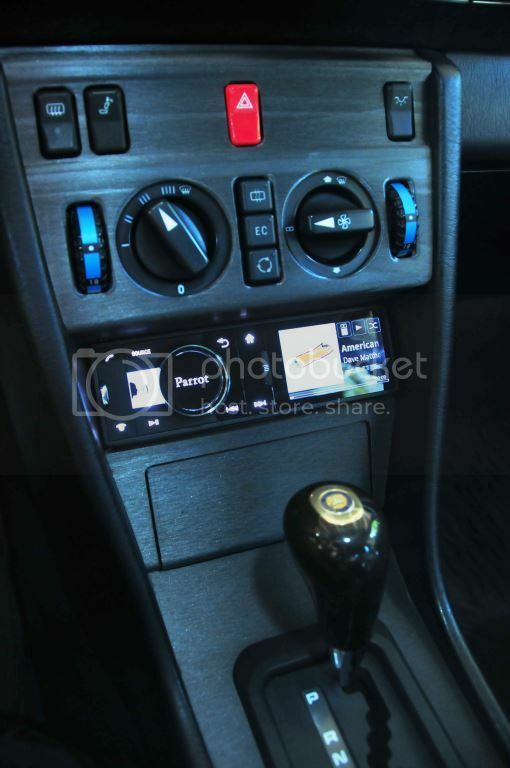 I actually just bought another one for another car, to replace an iphone compatible Alpine head unit. The Parrot is much better. I must admit I only use it for my iphone and making calls in the car. I don't use internet in the car and have a different Navigation system... It wouldn't be safe to look down there much whilst driving! There's also the Parrot Asteroid Smart, which is a 2 DIN unit which is even more clever, but it won't fit a W124 console. I bought it for our RV and plan to fit it soon. There's another Parrot head unit with lots of buttons you'll see on Amazon. I think that's a first generation. Avoid that. I think it's not so good as the two above. 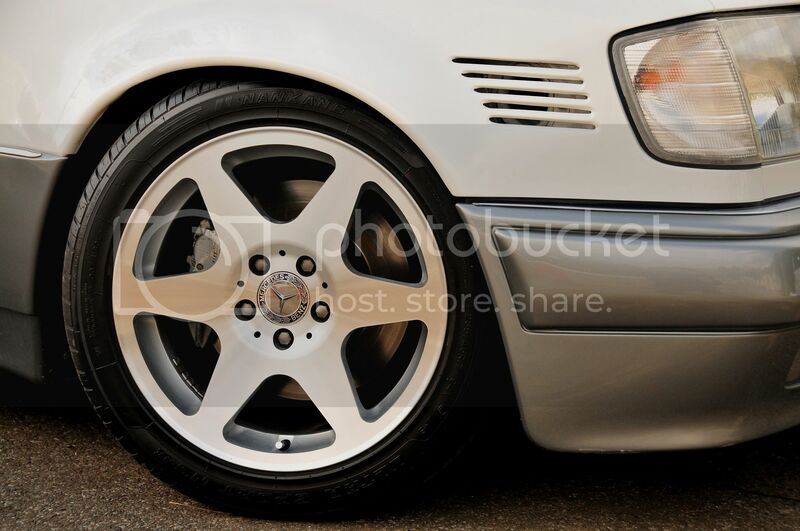 As mentioned earlier - the car already has 500E brakes, but in 1993 Mercedes specified even larger and thicker discs and these will be noticeably larger but still fit well within the Evo wheels, which also came off an E500 facelift model. 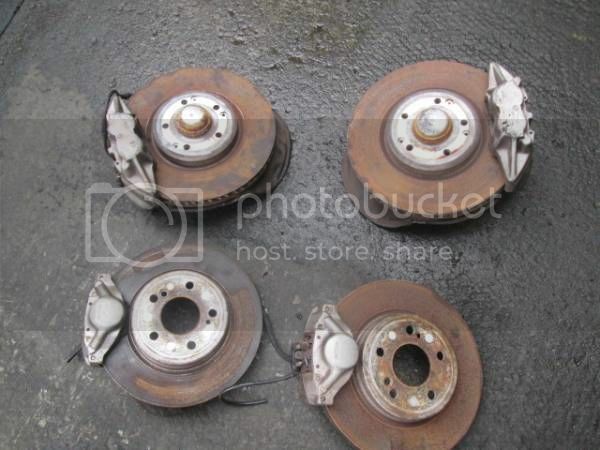 The existing brakes on the car can be sold to recoup the costs for the brakes bought today. 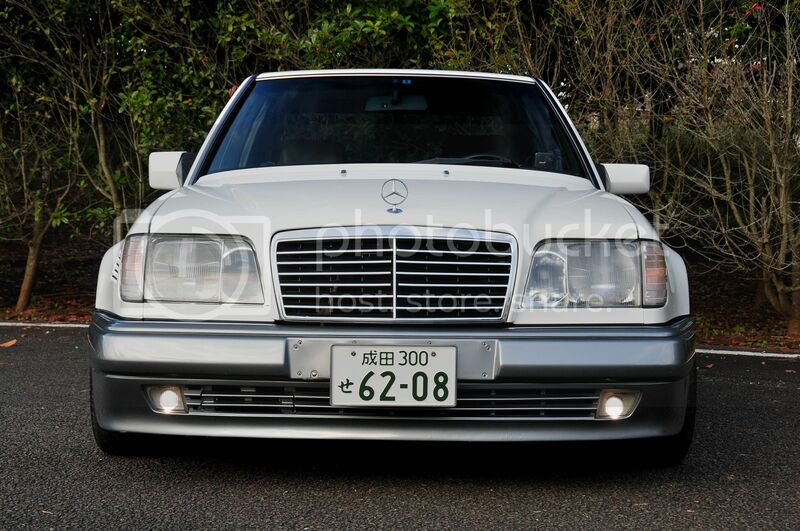 I also picked up the E500 front bumper (front the same car) which is rare to find. This will be a bit wider than the existing bumper, but I am confident I can make it fit, even if I have to modify the bumper a little bit to do so. 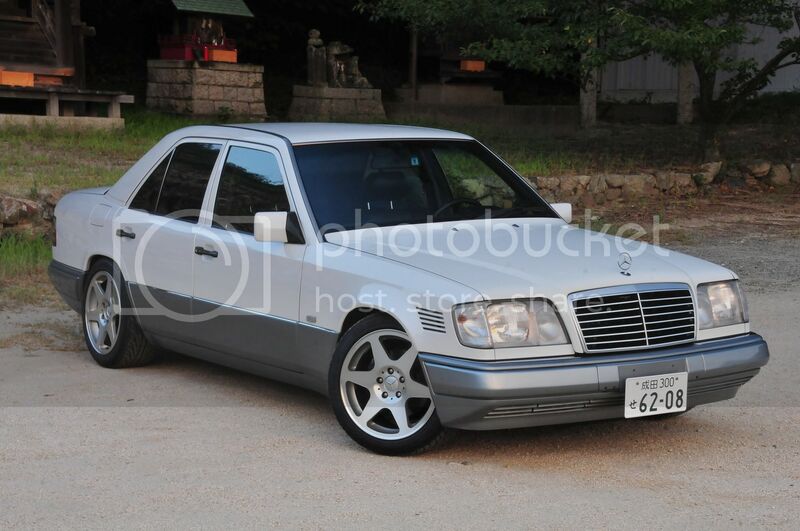 I guess I could switch the reflectors over to the E500 headlights? Don't know... I may just go with what I have, as the difference is only minor. 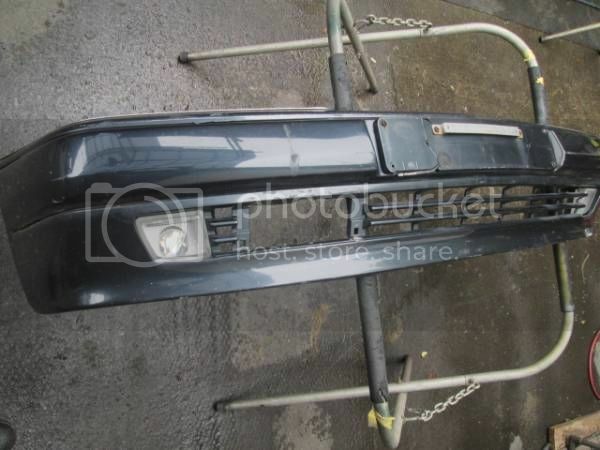 Here's the bumper as it will be to begin with. The vents in the bottom are much larger than on my bumper - better for the oil cooler. Your car is gorgeous! I think this is the first white/gunmetal two tone i have ever seen. 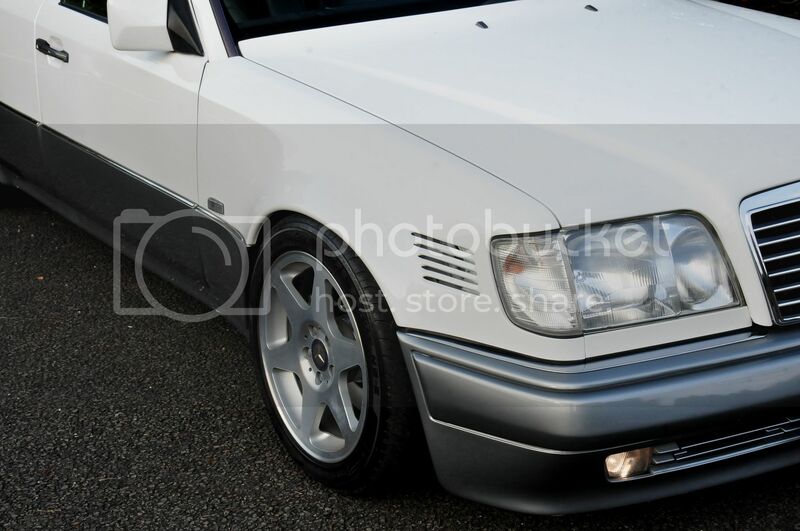 I am sure all W124 owners aspire to have an example as clean as yours. The tasteful OEM upgrades are the cherry on top of the cake! 1974 L508D Motoroam Monarch "NightMare"
I didn't like those, so I bought a set of mint facelift W124 plastics and fitted them. It's not always so clean. My wife mistreats it and recently cracked the rear bumper.... 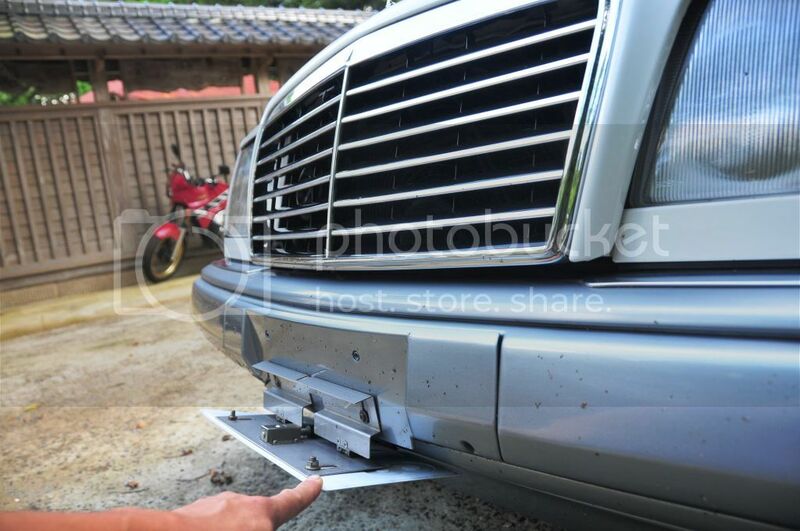 So now I'm kicking myself for not buying the E500 rear bumper when I bought the front. 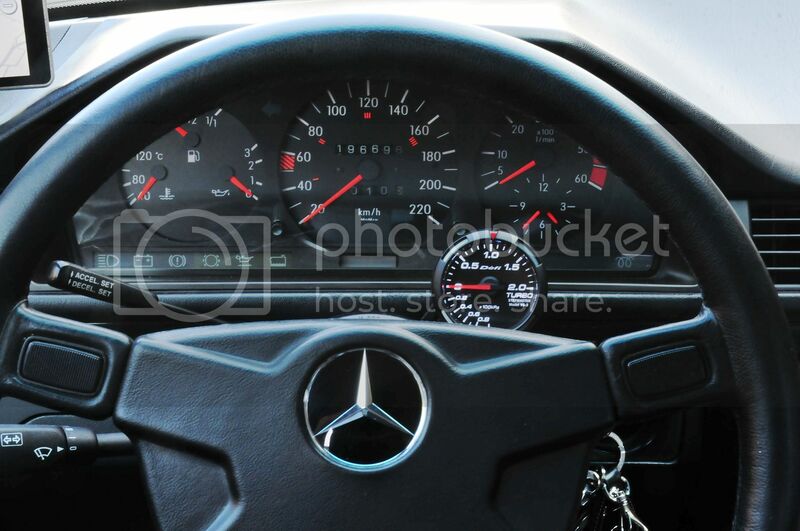 Right now I'm using my spare time for other projects, so the Benz just gets driven daily. I haven't even fitted the E500 brakes in place of 500E brakes yet. As for engine tuning, I've decided to stick with standard power on this car... It's fast enough as standard & smooth, reliable, etc and I have other faster machines to play with,; my wife doesn't need more power on the school run. 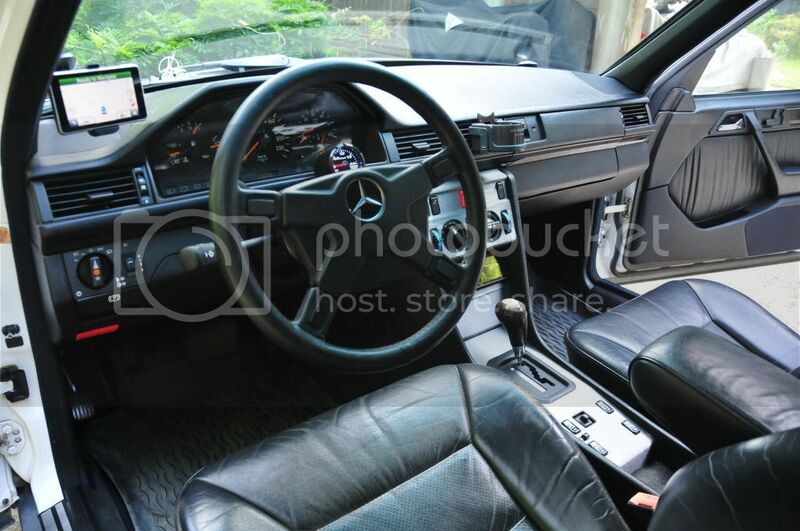 I actually just picked up a 1995 E300 Diesel (OM606) this weekend myself. 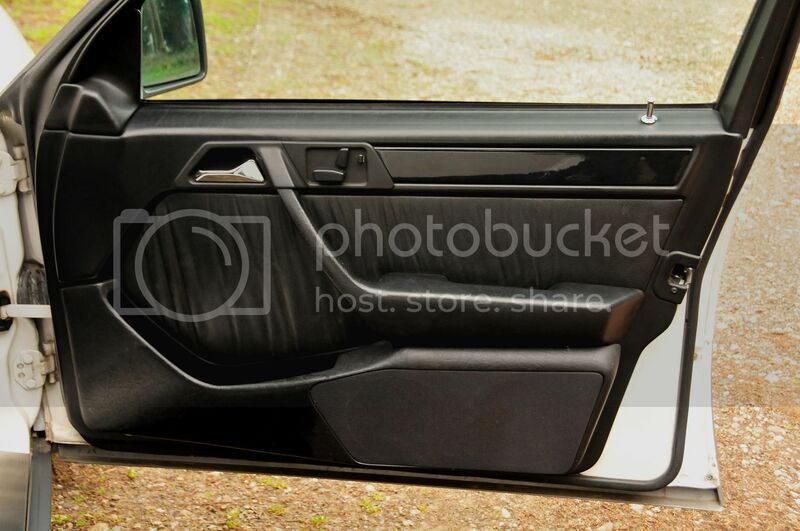 its white on, lets say, less white lower trim. Really considering following the same route as you with the darker lower trim. The two shades of white dont do it at all for me.. 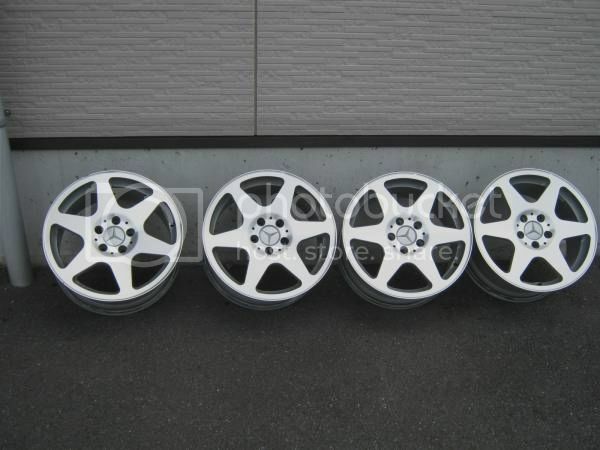 Sounds good - I have another set of Evo II rims if you want to create the same look. You'll need some lowering springs & Bilstein dampers. 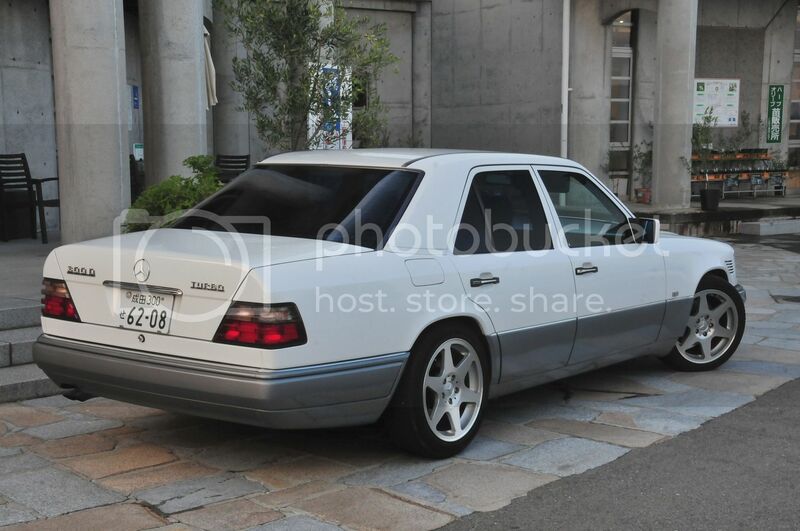 E500 rear anti roll bar & E320 Coupe front are good too! 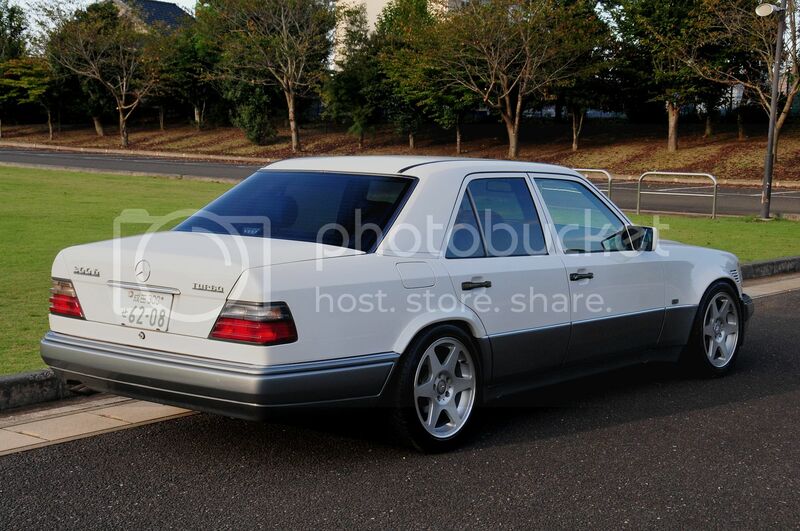 The wide body conversion using E500 & AMG parts was completed last summer. Lots of parts needed changing to make this work, but it's pretty much done at last. I'm not entirely happy with the AMG rear arch extensions but there's an E500 replica flare set to be fitted in the coming summer.. This is how it looks now. Might put a discreet lip spoiler on the back & I have a spare pair of panels to go under the headlights which I'll cut carefully and have painted before fitting black mesh, to add ventilation. Also have a front number plate trim to fill the ugly gap at the centre of the bumper, which needs fitting and painting, but aide from these 3 intentions that's about all I am thinking of doing for the exterior. Next will be some high quality carbon fibre laminating on the centre console and retrimming the headlining with one piece of alcantara, plus the B pilar trims and a few other bits by Robson Leather, in Tokyo. Wheels sit nicely spaced within the arches. No rubbing at all, after having trimmed about 1cm off the inside of the rear arch, to accomodate 10mm hub centric spacers at the rear. Front didn't need any work on the original 500 fenders. 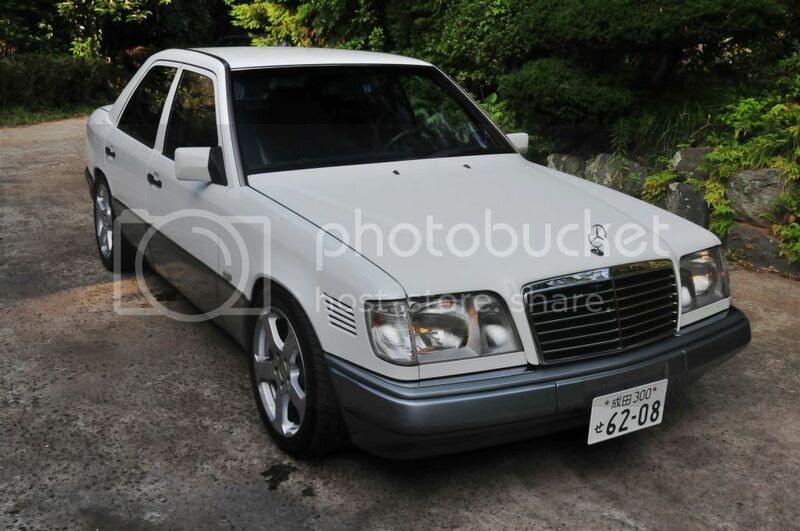 The front looks much better now than with the narrow original W124 bumper, E500 headlights, Avant Garde Grille and the Turbo's air intake. I wonder how many people will realise the work that's gone into making this, when they see it on the road, or if they'll think it's a standard body for a 300D Turbo? Next post will show some high quality carbon fibre laminating on the centre console and retrimming the headlining with one piece of alcantara, plus the B pilar trims and a few other bits by Robson Leather, in Tokyo. Did a few improvements a couple of weekends ago incl. cleaning the entire car again. Fitted new Performance Porterfield brake pads and washed each entire suspension & inner arch area of grime, etc. ready for a coating of corrosion inhibitor aircraft grade wax once the pit area being built in our garage at home is completed. Aside from some on the front lower arms, I found no corrosion at all - none expected but still it's good to know the underside remains in such great shape after 25 years, before additional protection! The oil cooler on the 300D meant the original front E500 plastic inner arch liners wouldn't fit right. Not happy with a used set, I'd ordered new MB ones. Cut an area neatly to allow the oil cooler bracket to protrude slightly and now they fit - perfectly. With the wheels off, it was a good opportunity to give them a proper clean and polish. The front bumper has a small scratch & chips. etc. as does the rear. Also still have E500 replica arches to have done, but I'm - saving this work to be done whilst we're away for the summer...means the body shop isn't rushed at all. The thought crossed my mind I could replace all of the birdseye E500 Limited wood with carbon laminated trim, but I like the birdseye too, besides - it was so hard to find (Couldn't get the centre console with these air con controls - hence the carbon laminating instead), so I'll stick with the contrast I guess. It works well I think. The Jenhert speaker conversion is working well. Once I had figured out how to assemble the replacement door pockets so the screws wouldn't work their way loose from vibration produced by 2 subs in each door! Sill plates are working well too, happy with these. 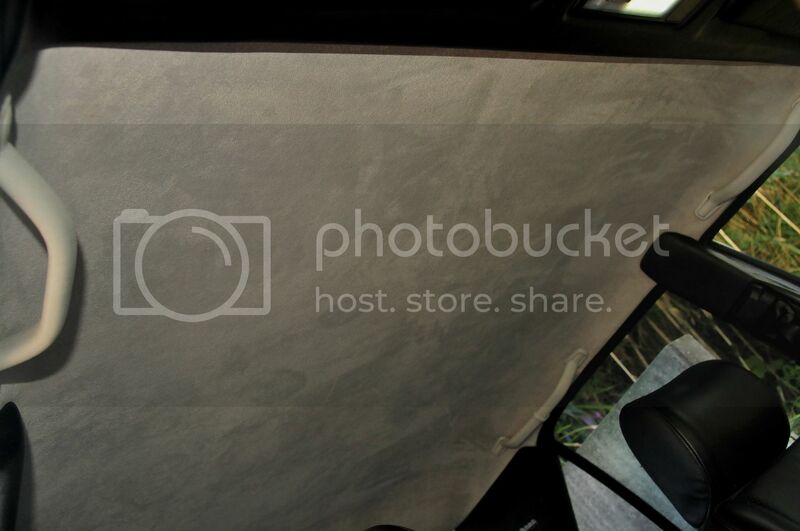 A picture of the 1-piece suede head lining. Had to find a used driver's grab handle, as this car originally didn't have one there. Found it cheap on Ebay. Sorted. Still haven't fitted a set of c-pilar reading lights from an E500 Limited, as I'll need to wait till the next time we have one of those around and I can take measurements, etc. ??????????????????????????????? 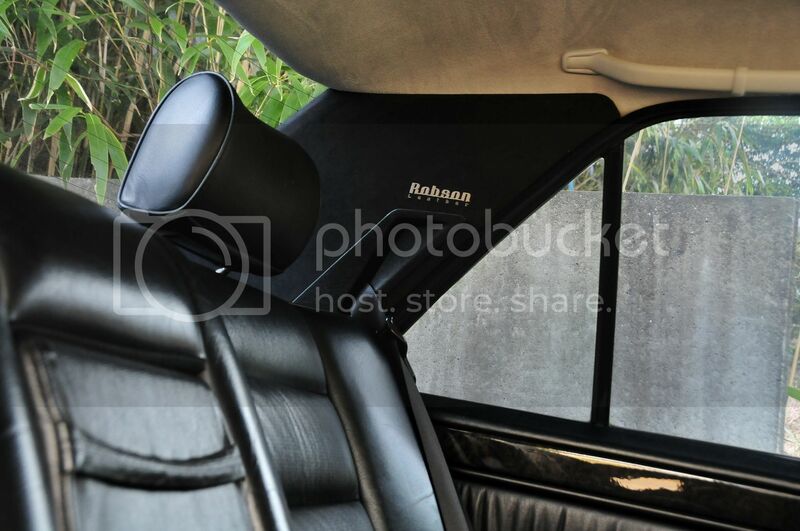 are currently in the process of making a Recaro styled 3 person rear seat to match the front Recaros. 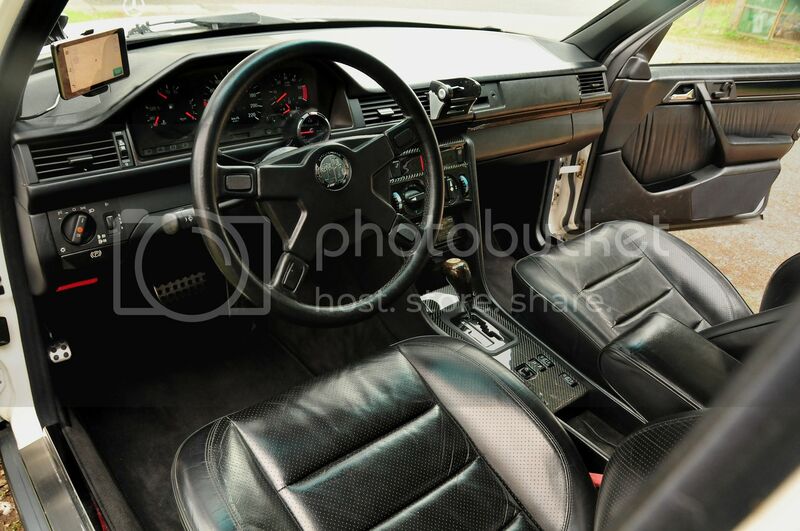 The newly re-trimmed seat will be done in Nappa leather and include full seat heaters too. Also recently noticed the hydraulic engine mounts are vibrating at times, so they've reached the end of their useful lives. New mounts to go on soon. Still happy enough with the standard power of the 3 litre turbo, plenty of torque and it's totally reliable, so I've decided I won't be uprating the pump. It's got 261,000km now and runs like new, so may as well do another 250,000km and beyond. 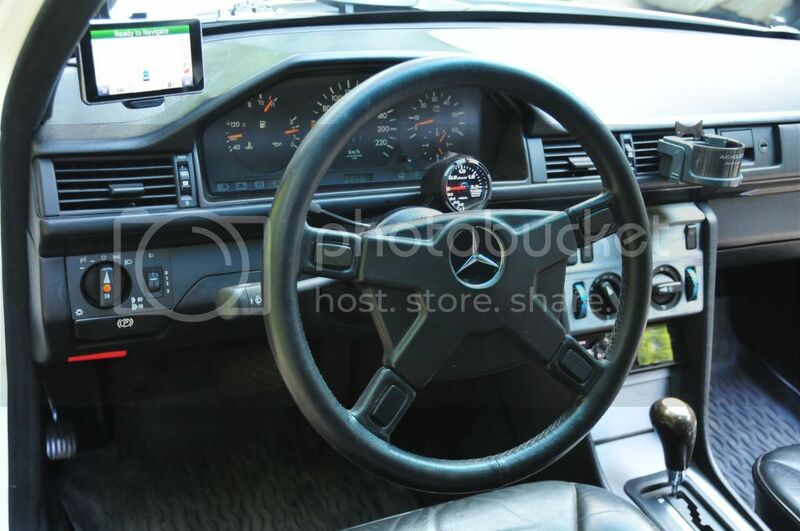 Holy cow, it looks so proper now with the e500e front end. Hey, I would take it as a compliment that the modified look appears factory, it means that you did an excellent job!